-Thinks it makes some good points, but doesn’t become drooling Toll-House fanatic. Maybe I've just been unfortunate. Like many things related to Hyperdox Herman, that particular example only seems to exist on the Internet. And drooling, like many things in life, is often difficult to discern when coming from one's own mouth! It does get tiresome having to change my soaked shirt all the time. The drooling, like the toll-houses, are metaphorical. Can't get to sleep without BOC's "Don't Fear the Reaper"
Loves forward to "Genesis, Creation and Early Man"
are there not any orthodox romany people? The Orthodox eparchy of Presov, Slovakia has supported a mission for the abandoned and neglected children of the Roma for many years at its Children's home in Medzilaborce. I know some, both in Romania and here, though most of them seem to be in one of the Protestant sects (or 'pocaiti' as they are generally referred to in Bucovina) such as the Pentecostals etc. Not sure NicholasMyra's joke about (I presume) historic enslavement of gypsies in Romania is in particularly good taste. what is this supposed to mean? whats the connection between the two? jckstraw72, just a warning, this thread and meme are mostly for raging liberals. Just warning you before the debate of Fr. Seraphim Rose ensues. This thread should be free from all debate. The only people who have trouble here are those who lack a sense of humor. Not sure NicholasMyra's joke about (I presume) historic enslavement of gypsies in Romania is in particularly good taste. I'm sure it is in the best taste ever. If you say so. Personally I don't think it's possible for jokes about slavery to be in good taste - ranks up there with holocaust jokes really- but whatever floats your boat. oh dont worry, i realize that. but i honestly dont understand this one at all. what is the connection btwn Ecumenism and the forward to GCEM? If I recall correctly there is a forward by Fr. Damascene and also one by a Protestant. It is the latter I was referring to. 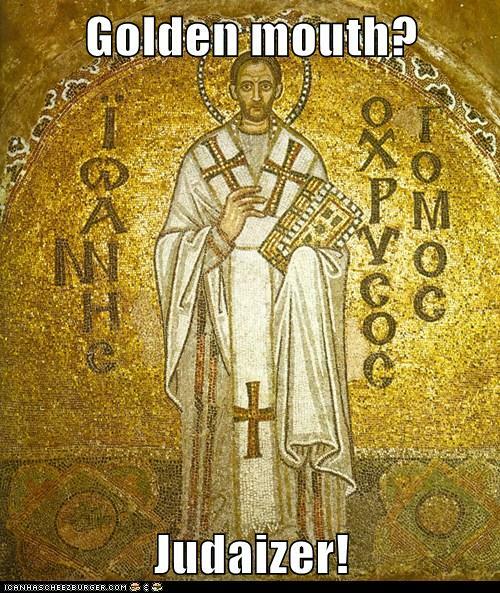 A subtle joke on how quite a few jews have golden teeth and St. John preached againt adopting jewish practices. jckstraw72, just a warning, this thread and meme are mostly for raging liberals. By liberals I mean leftists. Un-Orthodox Herman: Makes memes mocking fellow Orthodox. Thinks humility is for "Hyperdox". I probably was in the wrong here. Please forgive me if I have offended you. It's okay, it's not about me. That's my problem with this meme, it mocks people. Whether or not these people should be doing things, mocking them does nothing but turn people away from Orthodoxy. I have a sense of humour, I just think this keeps people from coming to the Church (or leaving if they are struggling with such issues). I agree. There is no need to mock anybody. Some passionate Orthodox could really be offended. The original intent was to mock ourselves in a friendly way, or to post things so outlandish that nobody would actually adhere to it. If it strays into cruel things, then it's gotten off track. The "good bye" one is pretty good. now, that's a roll on the floor laughing one! if only i could persuade my husband that a monastery visit counts as a weekend away together, i would be herman's hyperdox auntie! Ees outrage! How can he not know that Smirnoff is Jewish?